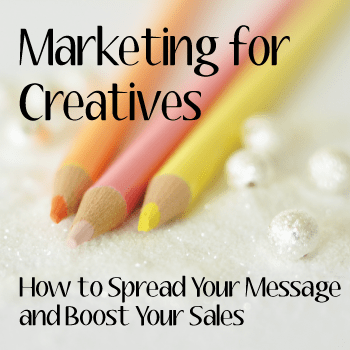 Editor’s Note: Today I bring you this super insightful and wonderful post by April Bowles-Olin of Blacksburg Belle about Marketing for creative businesses. In case you are wondering, I agree with all of it, save for the part about guest posts because mostly I stay in my bubble… Enjoy! When I started my creative business, I didn’t grasp how important marketing would be to my success. I saw people starting and building creative businesses and figured that if you had a good product, you wouldn’t need to work so hard on marketing. I was so wrong. I soon realized that the saying, “Build it and they will come,” didn’t apply to small, online businesses. After I understood the importance of marketing, I became a devoted student reading books and blog posts on marketing, experimenting with different techniques, and even attending conferences that focused on marketing. And, I’ve learned a lot. Today I thought I’d share a little bit of that with you. Why do you do what you do? You need to have a clear answer for this question, and you need to be able to convey your “why” to potential customers, current customers, and press. When you build your business around your why, you also build a loyal following of people who share your values and beliefs. That will lead to a long-term, successful business. 2. You have to remind people that you’re around. People are busy. They forget about your amazing products and services even though they love them. A potential customer might fall in love with your handbags in August and plan on getting a few for Christmas gifts for family members, but if she doesn’t remember how to find your shop again, you’ve lost those sales. The best way to keep in touch with potential customers and current customers is through an email newsletter. Most people check their email regularly, so if you email your list consistently, they’ll remember you exist. That potential customer will remember to buy her Christmas presents from you when you send out an email reminding your customers to place their orders by a specific date in order to ensure they receive the products before the holidays. I have four times the amount of people subscribed to my email newsletter than I do subscribed to RSS. I would be losing out on a HUGE amount of potential customers if I didn’t have an email newsletter. 3. People want what other people want and have. It’s true. I know you want to believe that you aren’t influenced by your peers, but you are. That’s why you have to use social proof to your advantage. Make sure you’re using testimonials throughout your site and shop and if you’ve been featured on popular blogs or in magazines, flaunt it. I saw a large increase in sales when I started using testimonials wisely and when I added an “as seen on” section on the sidebar of my blog. 4. Landing guest posts and interviews is much easier than I thought. I was nervous when I submitted my first guest post pitch and when I submitted my first interview pitch. I didn’t realize that bloggers, editors, and writers are constantly looking for valuable information for their audiences. If you can provide it, they usually want it. If you’re looking for a way to increase your blog or shop traffic in a short amount of time, pitching guest posts, interviews, and features is the way to spend the time you set aside for marketing. 5. You always need to be marketing. Successful entrepreneurs know this to be true. Even when the sales are rolling in, you should continue to spend time on marketing. If you don’t, your sales could suddenly decrease, and then you’d have to work extra hard to get it going again. My advice is to spend time learning about marketing and implementing what you learn every week. It’s worked for me. I hope you benefit from some of the lessons I’ve learned. Thank you for such an informative post. I am attempting to get my sewing business ‘off the ground’. I just wanted to say I think you’ve been doing great. I feel like I see your items everywhere (including front page of Etsy a minute ago!) and that’s such a wonderful thing! Your products are awesome. Keep up the great work and thank you for being so open with advice and personal experience! While the author clearly has good intentions with this paragraph, I’d encourage business owners to determine for themselves whether or not e-mail marketing will perform well. In this case, to say it is the “best” option for client retention and acquisition is a complete matter of opinion. If the author’s only success measure and justification of this recommendation is the generalization that “most people check their e-mail regularly” surely you could say the same for any marketing tactic. Most people check their USPS mail regularly, but I wouldn’t recommend a direct mail campaign as the “best” option my clients. Key takeaway: test, learn, and optimize marketing for your own business. I completely agree with you when you say that you should experiment to see what works for your business and learn from it. 100%. But, I do maintain my position that email newsletters are the best way to keep in touch with potential customers and customers. I didn’t go into all of the reasons in this post, because that’s a post itself. I’ve covered the topic on my blog extensively. But, I’ll give you my reasons since you bring it up. 1. First, I wrote this post with the intention of sharing marketing lessons that I’ve learned from my own business. If I didn’t stay in touch via an email newsletter, I would be losing out on a lot of relationships that I’ve built with these people. I have five times the amount of people on my email newsletter list than I do following my blog, because many people still don’t use RSS feeds. I’ve learned this from Darren Rowse from Problogger who has also had the same experience. Also, I’ve built lasting relationships with my email newsletter subscribers. Almost every time I send out an email newsletter, I get feedback from multiple subscribers thanking me for the information I’m providing. And, I always see an increase in sales–always! 2. I’ve worked with many creative entrepreneurs through group coaching and one-on-one consulting. Each one that has used email newsletters in the way that I suggest–by building relationships with the subscribers by providing value in some way have seen an increase in sales, repeat customers, and long-term success. I didn’t just pull this concept out of thin air. I made sure it worked across the board with all creative businesses that I’ve come across, and it does. 3. There isn’t a better way that I can think of to remind people that you’re around and to connect with people who are interested in your business but haven’t bought from you yet. When you connect via social media like Twitter, Facebook, or blogging, you’re only reaching a small amount of your “right” people. Sending out physical mail wouldn’t work–how would you get people to sign up to receive that mailing and wouldn’t it get extremely expensive? 4. When people sign up for your email newsletter, they are basically raising their hands and saying, “I want to hear more. I want to know more about your business.” They’re interested and those are the BEST people to market to, because want more information. They aren’t just random people who signed up to follow you on Twitter. If they decide that they don’t want to know anymore, they simply unsubscribe. So, you continue to connect the people who want to know what’s going on in your business and disconnect with the people who aren’t. 5. It usually takes more than one “touch” before someone buys something from you. People usually don’t buy the first time they come across your shop. If they love your stuff and sign up for your email newsletter list, you have the chance to build that relationship by providing value, telling your story, and connecting and that definitely increases the chance of a future sale. Again, this isn’t a matter of opinion–it’s something I’ve experimented with and tested again and again not only with my business but with MANY businesses. I work with online, creative businesses and this is who this post is written for. I stand by the fact that right now this is the best way for online creative businesses to connect with potential customers and current customers.